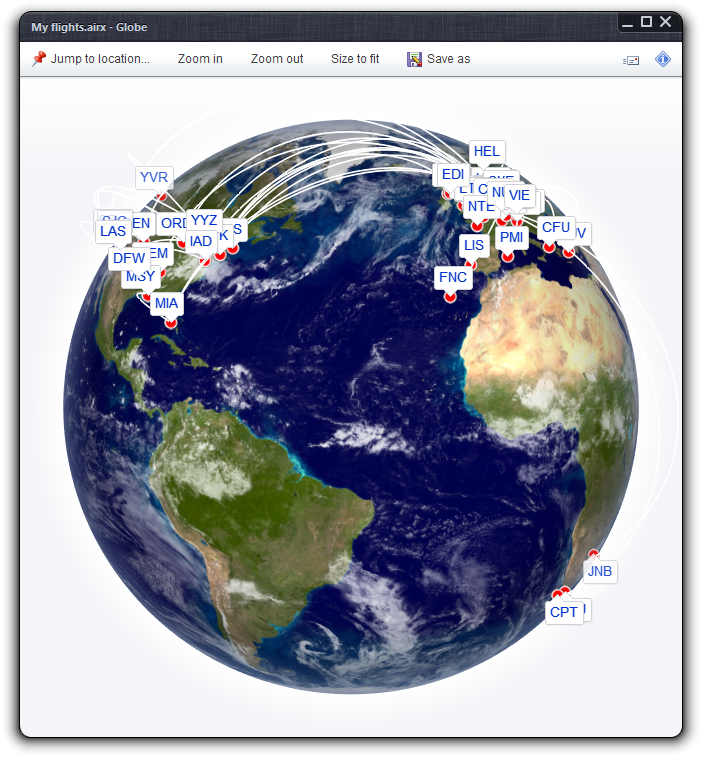 In addition to producing high-resolution maps, Flightmap can also visualize your itineraries on a built-in 3D globe that does not require Google Earth to be installed on your machine. 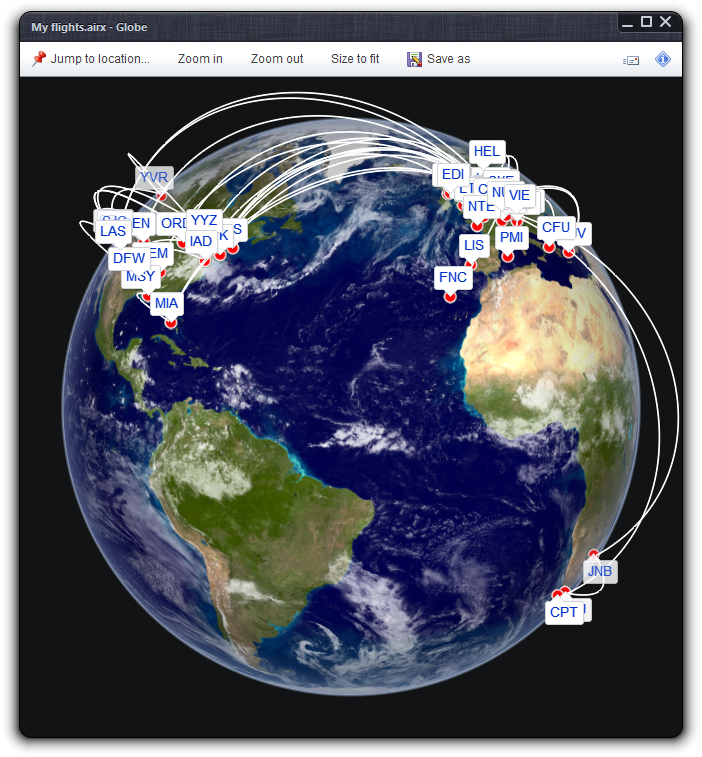 As Flightmap animates the globe and renders each frame on the fly, most settings don't need to be made in advance, but are available directly in the globe window. The exception is merging nearby locations that are assigned to a common metropolitan code (e.g. 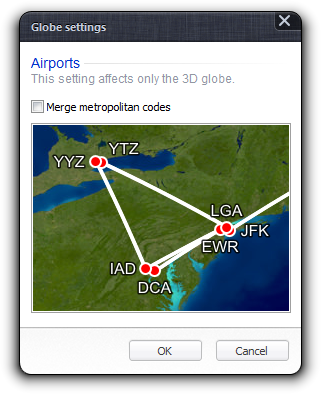 EWR, JFK and LGA become NYC), because this affects the data taken from the itinerary and transferred to the globe window. The globe is displayed in a new window. It might take some until the window appears due to loading high-resolution texture maps (courtesy of Nasa's Earth Observatory)—please be patient! The new window allows you to save the routes displayed as Google Earth overlay, and to set various view options—the globe will get updated immediately. You can rotate the globe by clicking it outside any label and dragging the Earth's surface. Use the mouse wheel to zoom in and out. Right-click the globe to access its context menu. “Show locations” will mark all airports in the displayed itinerary with red dots. In addition, if at least one of the four following options is checked, a label is placed above all locations, presenting the IATA code, airport name, GPS coordinates and the movement count respectively. Right-clicking a label allows you to open the location in Google Earth. You can also switch to a dark background for the globe window, so routes are more visible.